Rakesh Jhunjhunwala expects retail sector to grow up to five times its current size in the next five years. NEW DELHI: Ace investor Rakesh Jhunjhunwala expects retail sector to grow up to five times its current size in the next five years. "Retail is one of the best sectors. It offers most opportunity. I recommend looking at companies which have a high chance to scale up," Rakesh Jhunjhunwala said at a CII conference on Tuesday. He went on to state that retailing is a great opportunity and the winners will emerge in 5 to 10 years. It may be better to invest more when the winners emerge. "I do not know $500 billion is the size of the retail market in India and organised is about 8 per cent. There are going to be a lot of most specialised retailers and do not forget one thing that if you look at the billionaires list of any country, two people are always from real estate and retail. 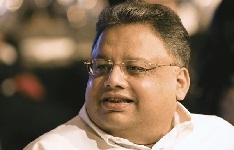 So retail has got many more billionaires to come ," said Jhunjhunwala.